Most homeowners have automatic garage door openers to save themselves and their vehicles from the extreme Southeastern MN. weather conditions. It's a great convenience and one that is often taken for granted until the day you lose all electrical power. You have somewhere you need to be and you can't get in or out. Now what do you do? 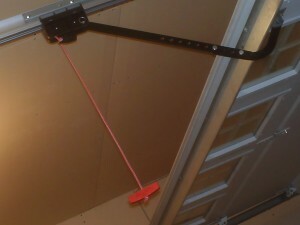 Your garage door opener will have a short rope with a red "T" handle hanging near the drive unit. Pulling this T handle will release the door from the drive chain or belt, allowing you to manually operate the door. Your home inspector suggests you test the emergency release from inside the garage, with the door down to make sure it works properly. It is VERY important to do this test with the door in the down position. If the springs are not adjusted properly, a released in the up position can crash to the ground! The rope with the T handle will release the door with a slight pull. The mechanism will re-engage when you move the door or run the opener. When performing this test, have someone else outside the door. If there are any problems, they will be there to assist you. If you have questions, contact you're your local Rochester MN, or Southeastern MN garage door company for details or to offer an explanation.